The phrase ‘rogue states’ has been conjured up with deadly purpose, by major world powers, in particular the United States, to describe weaker countries who have fallen out of favour with the West, some of whom enjoyed the role of client states for many years, or were permitted to rule despotically under the benevolent threat of ‘regime change’ if they in any way proved politically or economically difficult. Issues of human rights never entered into it. 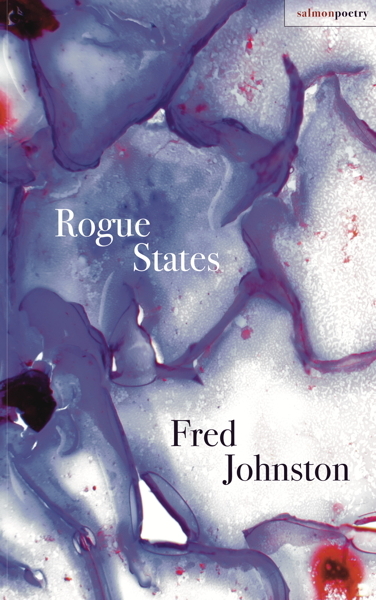 Johnston’s new collection of poems adopts the phrase and personalises it; serious illness is seen as a ‘rogue state,’ a usurpation of the lived ordinary, a demolishing of physical and moral routine, a form of invasion. In illness, as in civil turmoil, civilising rules are often turned upside down or disregarded, a powerful and selfish striving for survival develops. Other poems take on the mundane everyday, the speculative, and contemplate the uses of the poetic imagination in a society where, in the poet’s view, poetry itself is under siege and its use and importance reset. Politics and society can never be outside or beyond the poet’s critical reach. At a time when poets and writers in less humanitarian societies than our own can still suffer – and are suffering – imprisonment, the banning of their work, or much worse, we have, he would maintain, a duty to use our freedom to speak out against injustice, even at the risk of being labelled ‘rogue’ ourselves. Fred Johnston was born in Belfast in 1951. 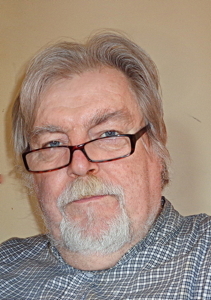 Most recently, his poems have appeared in The Spectator, The New Statesman, and a short story in Stand magazine; some more new work is also due to appear there. In 1972, he received a Hennessy Literary Award for prose. In the mid-Seventies, with Neil Jordan and Peter Sheridan, he co-founded The Irish Writers’ Co-operative (Co-Op Books.) In 2002, he was a co-recipient of the Prix de l’Ambassade, Ireland. His most recent collection of short stories, Dancing In The Asylum, was published by Parthian. In 1986, he founded Galway’s annual literature festival, Cúirt; in 2002, he was writer-in-residence to the Princess Grace Irish Library at Monaco. Fred has published nine collections of poems, four novels and two collections of short stories, one of which has been translated into French. He has also composed poetry in French and published it in France in magazines such as Ouste, Hopala!, Le Moulin de Poésie and Le Grognard, among others. Written for the visit of the Lajee Dabka Dancers to Galway, from the Aida refugee camp in Palestine. The phrase ‘rogue states’ has been used by world powers like the US to demonize countries which have fallen out of favour with the West. Johnston’s book adopts the phrase and personalises it; serious illness is seen as a ‘rogue state’. Other poems address themes of love and loss, family and friendship, and the place of poetry in a world of turmoil and injustice. The collection commences with a sequence of poems evoking Johnston’s experience of a cancer scare and its attendant treatment. ‘Diagnosis’ observes that "you went in as one man and emerge/as another, knowing secret things of blood/and tissue and deep scans. You could live/well without such knowledge. Or unknow it." The volume also includes a number of sharply tender poems about Johnston’s father. In ‘My Father Ought To Have Liberated Dachau’ he writes "My father might have done many things/worthy of a photograph/instead he dodged the monumental and settled/for the ordinary trudge, heroism of a different order." “He’s popped up in a lot of my poems over the years,” Johnston notes. “I have an admiration for him hence the ‘Dachau’ poem. He was the kind of guy nobody noticed. He was quiet domestically and yet he was involved in the labour movement and got fired for trade unionism in his day. He experienced a lot in his life; he came from a large family and was very bright. He won a scholarship but he didn’t take it because the family needed him bringing in a wage. Johnston holds strong political views on issues like Palestine and US imperialism but when he addresses politics in Rogue States it is mostly done obliquely. One exception is the trenchant ‘A Poem for You’, written in response to a Galway visit by a Palestinian dance troupe. It concludes with the couplets: "Do not offer me sand for bread/For I will make bread even from sand// Do not tell me who I am/For I am written in the Book of the World."